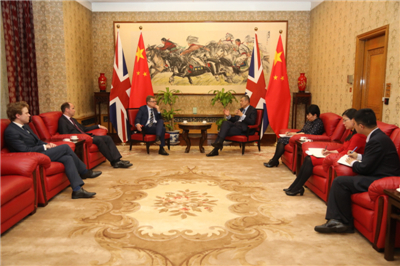 On April 18, 2018, Ambassador Liu Xiaoming held talks with Chris Evans, Editor of the Telegraph, Robert Winnett, Deputy Editor and Deputy Director of Content of the Telegraph, and Tom Welsh, Comment Editor of the Telegraph at the Chinese Embassy. 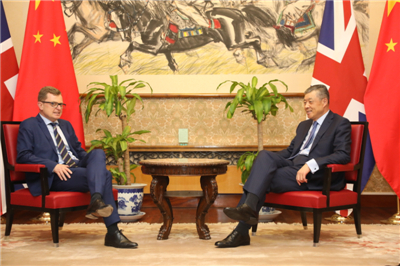 Ambassador Liu noted that The Daily Telegraph and The Sunday Telegraph of Telegraph Media Group are mainstream newspapers with global influence. In recent years, China-related stories in the two newspapers have continued to increase in terms of its quantity and quality, playing a positive role in facilitating a comprehensive and objective understanding of China in the UK and western countries. Early this year, Prime Minister May paid a successful visit to China. During this visit, the leaders of the two countries agreed to build a more strategic, practical, global and inclusive bilateral relationship. This year marks the opening year for the implementation of the blue print of the 19th Party Congress and the 40th anniversary of China’s reform and opening up. China-UK “Golden Era” is shifting to a higher gear. At the Boao Forum for Asia Annual Conference 2018, Chinese President Xi Jinping pointed out that, “China’s door of opening up will not be closed and will only open even wider.” President Xi’s speech showed China’s commitment to comprehensive and deeper reforms, greater openness, economic globalization and a community with a shared future for mankind. This November, China will host the first International Import Expo in Shanghai. The ambassador hoped that the two newspapers would continue to report on China’s development and changes in a comprehensive, objective and in-depth manner, so as to show a real developing China to the world. Mr. Evans said that China is one of the world's most important and fastest-growing countries. The Daily Telegraph and The Sunday Telegraph attach great importance to China-related reports, and stand ready to continue to pay close attention to China’s development, be more vigorous and objective in its reports and further deepen exchanges and cooperation with China. Ambassador Liu also shared his views on China-US trade tensions, China-UK relations, UK-Euro relations and other international hotspot issues.